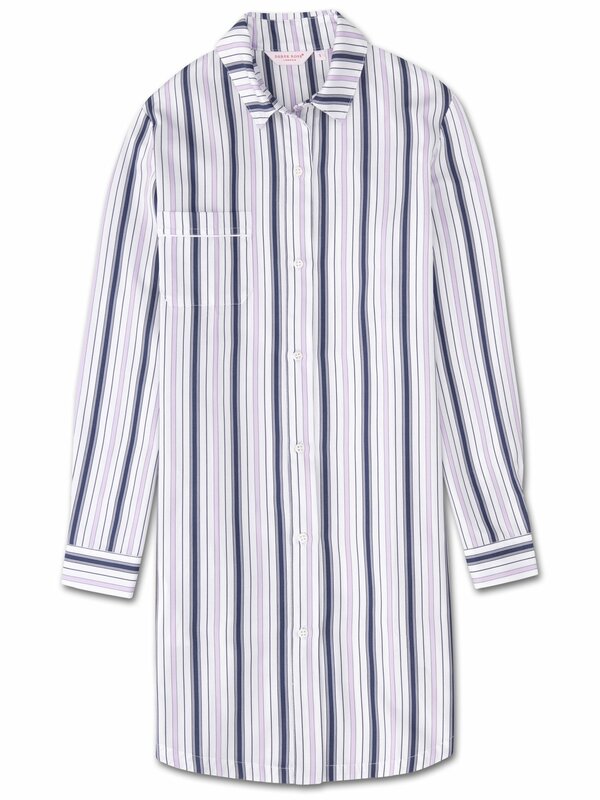 Made from 100% cotton, the Milly 7 button-through nightshirt features navy, pink and white stripes of different thicknesses, woven into a smooth and soft fabric for a luxurious sleepwear addition. This mid-weight seasonal nightshirt has a crisp textured, satin feel; ideal for colder nights and mornings when a more substantial weight cotton is required. When designing our women’s nightshirt we wanted to recreate the feeling of putting on a man’s shirt. The classic styling and formal collar and cuffs juxtapose with the relaxed fit for a stylish yet comfortable piece of nightwear. The nightshirt design also features a white piped breast pocket, hidden inset side pockets, side vents for added comfort and mother of pearl buttons for an added touch of luxe.